Home / News / FLOWER POWER! Breaking News! A mysterious and irresistible force has emerged on The People’s Coast, and its power is growing with every passing day. Already it has dramatically altered the natural landscape, changed our customary viewpoints and transformed our collective mood. It has created a frenzy of activity, setting the flowers abloom, the birds atwitter and the bees abuzz! Hereabouts, we call it “Spring,” and we assure you that any attempts at resistance are futile. Come experience its transformative power for yourself. And may the force be with you. Let’s get this party started by reminding you of this month’s perennial favorite, the Annual Rhododendron Festival whose theme this year says it all: “Nothing Short of Wild!” Take a leisurely two-mile walk on the wild side exploring the rolling dunes and beautiful beaches on an Oregon Dunes Family Hike. You’ll also experience a wildly good time celebrating the first day of sand boarding season at Sand Master Park. It’s all happening this month in Florence, where you’re always the master of your domain! We know, we know. Sometimes you just feel like getting the kids out of your hair and shipping them all off to Camp Plenty Poison Ivy or some such place. 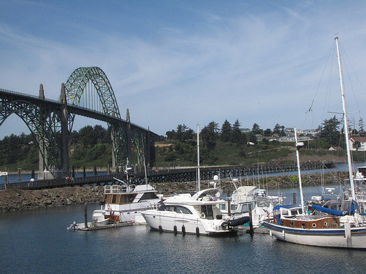 But here’s a better option: Take the whole family to Coos Bay, book passage on an Adventure Sail on the Tall Ships excursion and feel the wind in your hair! 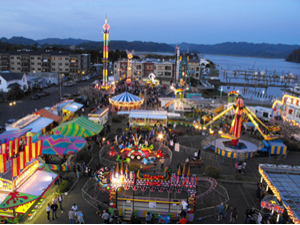 Or head off to Lincoln City for a treasure hunt for handcrafted glass floats, sand dollars and crabs on the beach. It’s Finders Keepers, losers – well, how can you lose with a walk on the beach? 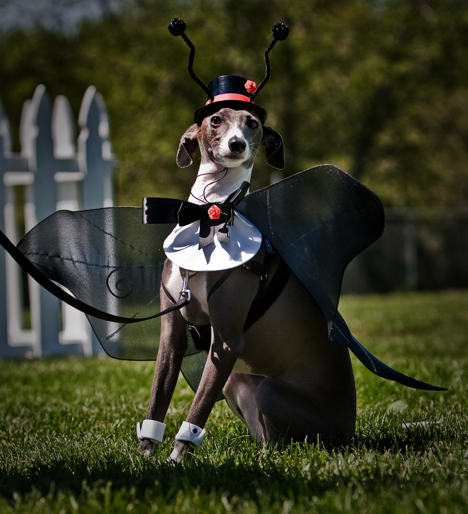 Don’t forget, this month is also the date of the annual Brewers Memorial Ale Fest in Newport featuring microbrews and music galore, plus musical chairs and celebrity look-alike contests for your pooch. Whoa, doggies! Newport will also be honoring the memory of our Vietnam veterans during its annual Loyalty Days celebration with a traditional hometown parade, a carnival, a fun run and more. Expose yourself to art and local artists at the Spring Unveiling of new works at the Bronze Coast Gallery in Cannon Beach. If quilting is your thing, Toledo has you covered with their annual Quilt Quest, where more than 300 quilts will be on display. Develop your leadership skills at the Chick-fil-A Leadercast simulcast in Newport. Vote your choice for the leader of the pack at the Fish Taco Cook Off in Lincoln City. Experience the Taste of Home Cooking in Florence. Discover just how sweet life can be by sampling the delicious varieties of fudge available daily at the Tillamook Cheese Factory. You say your plans are still up in the air at this time? Perfect! Driftwood Shores in Florence is offering a Land, Sea & Air Package that includes an oceanfront room and a half-hour helicopter tour of the coast. 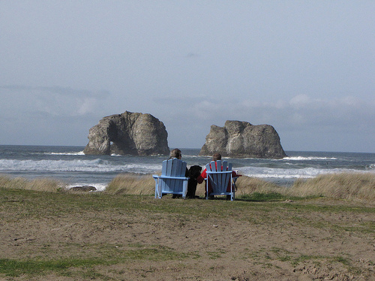 Stretch your legs and enjoy a picnic in Pacific City with a Three Cape Escape Package. And you won’t have to stretch your budget with this month’s third-night-free special at the Garibaldi House in Garibaldi, the $30 Off Special at the Whaler Motel in Newport or the 20 Percent Discount at Overleaf Lodge & Spa in Yachats. Come and stay you will, because on The People’s Coast the force is always with you. Here’s your chance to become an Internet sensation! If you’ve enjoyed a memorable adventure in the great outdoors of The People’s Coast, share your story with us online, on Facebook or on Twitter, where fame is just a tweet away. Making plans for a family adventure on The People’s Coast? Make sure to get The Official Oregon Coast Visitor’s Guide for 2012 -13. It’s full of useful information, and it’s always free for the asking! So plan to get your copy now! Along with our traditional hometown parade, held Saturday May 5th, Newport Loyalty Days festivities include the Queen’s Coronation, Davis Show carnival, car shows hosted throughout town, Coast Hills Running Club’s Fun Run, Vietnam Veteran’s remembrance with our annual Memorial Reading of the Names and the Field of Flags….just to name a few of the many activities you will find in Newport. Every Spring the members of the Cannon Beach Gallery Group look forward to the weekend when they unveil the newest work by their featured artists. This has become one of the most anticipated annual arts events in Oregon, because it gives the art lover an opportunity to meet the artists, watch many of them at work, attend the receptions, enjoy a wide variety of food and music…and take in everything this postcard-perfect town, nestled between the wild Pacific Ocean and the coastal mountains, has to offer. 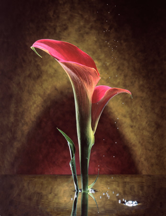 Bronze Coast Gallery is proud to announce two esteemed artists will be participating in Spring Unveiling. Scott Peck, acclaimed for his photography of florals, & wildlife sculptor Don Rambadt. For more information call or visit the website. Chick-fil-A Leadercast Lincoln County is a one-day leader development event broadcast LIVE from Atlanta, Ga. to hundreds of sites throughout the nation, including Newport. This year, Chick-fil-A has put together an unprecedented speaker line-up featuring renowned leaders from virtually every circle of influence who will come together to share their personal leadership experiences and wisdom. Touch up your leadership skills as you listen to information on Making Choices That Matter. During the Finders Keepers season the Lincoln City VCB places extra pieces of glass art on the beaches for beachcombers to find. 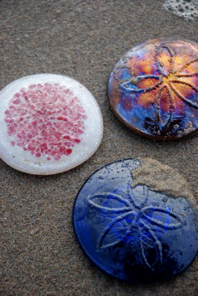 One hundred additional glass floats and fifty sand dollars or crabs will be placed along the 7.5 miles of Lincoln City beaches, weather and ocean conditions permitting. Get ready to savor the joy of cooking through this event, an experience that will leave your hands full of goodies and mouths salivating for some of the delicious food prepared right in front of you. The event is from 4 – 8 pm at the Florence Events Center located at 715 Quince Street. Admission is $15. Howie Mandel’s versatile career has encompassed virtually all aspects of the entertainment spectrum, including television, film and stage. From his work on the Emmy-Award winning “St. Elsewhere,” to the international animated children’s series “Bobby’s World,” Howie has become a mainstay of the American comedy scene. Howie is set to perform two outrageous shows Friday & Saturday night at 8pm. Tickets are on sale now at the Chinook Winds Box Office. Thirty-eight kite-flying professionals will take over the skies of Rockaway Beach the second weekend in May. Come join in the fun – there will be kite flying, kite making and maybe even a chance to dance in the sand! The weekend is about kites, large and small. There will be ballet kites dancing to music; box, dual line and multi-line kites; quick, maneuverable sport kites; fighting rokkaku kites and kites the size of a school bus (so we are told)! Quilt Quest MMXII promises to be a fun, engaging event for quilt enthusiasts. Featuring local quilter, Linda Anderson, over 300 quilts will be displayed all over the town of Toledo . Meet local vendors’, find quilt supplies, patterns & equipment and much more. For more information, contact Monica Lyon at the Quilter’s Cottage. A Day of Traditional Irish & Scottish Music, Dance & Culture. The day includes workshops, musicians, buffet dinner and an evening concert. Takes place at the Hales Center for the Performing Arts located on the Southwestern Oregon Community College (SWOCC). Spend some time exploring rolling dunes of open sand, islands of pine forests, wildflowers, animal tracks, and beautiful beaches with your family this Mother’s Day. Hike a 2 mile trail for fun afternoon at the coast. Call for more information to join the carpool from Eugene. 9 am – 5 pm. With a $10 suggested donation. The 6th Annual Brewers Memorial Ale Fest will be held in Newport and will benefit the Central Coast Humane Society & Oregon Coast Therapy Animals. The dog-friendly brew festival is held inside the Rogue Ales Brewery and includes 50+ Microbrews, Live Music, Doggy Musical Chairs, Dog Wash, Dog Dancing and Celebrity dog look-alikes (Rin-Tin-Tin, Lassie, Benji and of course, Brewer). $10 admission fee gets you 4 taster tickets. Ages 21+ Admitted Only. 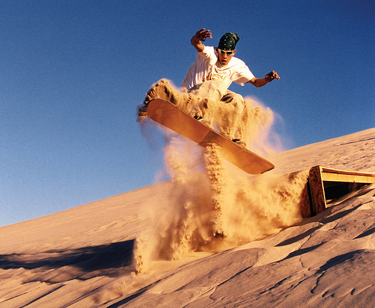 The official first day of sand boarding season and international observance. Come out for an amazing fun day in the sand. From 5- 8 p.m. enjoy a season starter bar-b-que. Bill Lackner will lead a hands-on clinic on clam digging in Siletz Bay as a follow-up to his Tuesday evening lecture at Driftwood Public Library. The clinic begins at 9am in the gravel pullout north of the Bayhouse Restaurant in Lincoln City. Participants will dig limits of purple varnish and bay clams. Admission is FREE. The first ever sanctioned Kansas City Barbecue Society event to come to the Oregon Coast! Featuring judging classes, bbq vendors and a thrilling competition where the winner takes home $5000. Come sample great BBQ, beer, and cheer on your favorites. Dockside Tours, Battle Sails, Educational Tours and passage are available for the annual Tall Ship days. 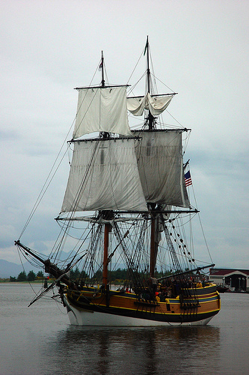 This year’s event will be extra special as BOTH the Lady Washington & Hawaiian Chieftain will be here. Children 12 and under must be accompanied by an adult. *Please note that tide conditions sometimes affect arrival date & times. Weather and ocean permitting, every day colorful hand-blown glass floats are places on the beach. If you find a float, bring it to the Lincoln City Visitors Center at 540 NE Hwy 101 to receive your certificate of authenticity and biography of the artist who made the float. A stop at the Tillamook Cheese Factory in not just for cheese and ice cream ! Have you tried our sweet, creamy, delicious Tillamook Fudge? A wide variety of flavors awaits you, ranging from Chocolate and Vanilla, to Amaretto Swirl and Rocky Road and many more in between! Be adventurous and try one of our fudge maker’s own recipes, like Candy Bar Bliss or Marionberry Cheesecake. Tillamook Fudge is home-made every day, and you can choose from individual pieces cut from loaves or convenient ½ pound and 1 pound packages. The Fudge counter is open every day from 8am to 6pm. The Culinary Center in Lincoln City is a great place to explore your culinary side. From cook-offs to classes there’s something to fit everyone’s experience level. Here are the classes being offered for May 2012. For more information or to sign up, contact Chef Sharon Weist. Learn to make traditional potato gnocchi with a tomato sauce. Price includes a $5 coupon for regular class. Instructor: Chef Sharon Wiest Cost: $20, includes wine pairing and meal. Learn to prepare a variety of delicious Moroccan dishes. Instructors: Chef Sharon Wiest and Pati D’Eliseo, A Posto Personal Chef. Cost: $50, meal and wine included. Learn to make a variety of tasty Latino dishes. Instructor: Chef Scott Neuman from Oba! in Portland. Cost: $50, includes beverages and meal. 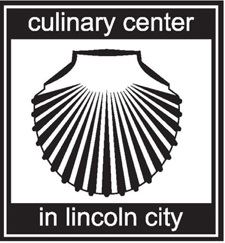 Come Celebrate Memorial Day by learning to make an mouthwatering apple pie at the Lincoln City Culinary Center Instructor: Chef Sharon Wiest Cost: $20, includes pie and beverage. Spring is a great time for a quick retreat to your home on the coast. Most spring days at the coast include some “sun time”, and the friendly atmosphere and great food at the Garibaldi House is always in season. For a limited time, you can get the third night free when you call us and book direct by phone. If you complete your stay by May 25, 2012, and stay two consecutive nights at our regular low spring rates, the third consecutive night will be our spring time gift to you. Our rooms fill up fast, so reserve early! Call us and ask for the spring 3rd night free special. We’ll have your room ready and the fireplace going when you get here. *This offer is not valid in conjunction with any other offer and is only valid when you call and book direct. If this is your first visit to the Oregon Coast and you’re anxious to see some of the gorgeous sights the coast has to offer? Or have you lived in Oregon for years but have never taken the time to enjoy the beautiful 3-Cape Scenic route? Well we have a delightful 3-day, 2-night Oregon Coast lodging package, features the north Oregon Coast’s gorgeous 3 Capes: Cape Kiwanda, Cape Lookout and Cape Meares, waiting just for you. Enjoy at your leisure a self-guided scenic “tour to remember” that includes a sturdy canvas bag filled with picnic supplies galore: Tillamook cheese and sausage, fruit, salt water taffy, your choice of Oregon Pinot Noir, Oregon Chardonnay, champagne, sparkling cider or Pelican beer. Also included is a tour brochure complete with maps and highlights you won’t want to miss. There is so much to see and explore that you just might want to stay another night to take it all in! 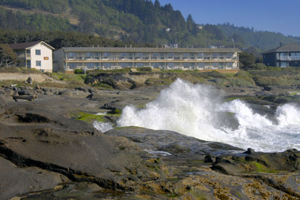 Nestled securely against a bluff overlooking the Pacific Ocean, The Inn at Spanish Head is Oregon’s only resort hotel built right on the beach! 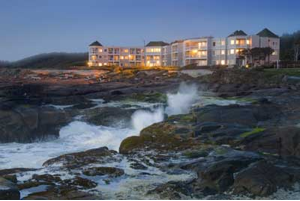 Each individually designed room is oceanfront with floor-to ceiling windows, perfect for whale watching. Oceanfront Lodging & dinner for two. Two adult Oregon Coast Aquarium tickets and a special gift. One night package starts at $225.00 plus room tax. Stay Sunday through Thursday and save up to 40% off. (Valid Sunday – Friday) All lodging offers are subject to restrictions and availability. Call to confirm special offers and details. Save $30.00 off regular rates Sunday-Friday on all room types, excluding Beach Houses. All rooms feature a private balcony overlooking the beautiful Pacific Ocean. Easy beach access. Warm hospitality and outstanding service! Special rates start at $69 -$89 (regular rate $99- $119) + tax for a standard balcony queen room. *Special excludes May 27, 2012 (Memorial Day Weekend). Special may not be combined with any other discount. For Reservations, call and ask for the $30.00 OFF Special! Bring a can of food to donate for each night of your stay and receive 20% off your room rate. Not valid May 27, 2012*. Discount not valid with other offers* and coupon must be presented at check-in. To print coupon visit our website and click on our specials button. Good Sunday – Thursday. 20% Off Lodging Special! Good Sunday – Thursday, Now – June 21st, 2012*. *Note: Bring a can of food to donate for each night of your stay and receive 20% off your room rate. Not valid May 27, 2012. Discount not valid with other offers and coupon must be presented at check-in. To print coupon visit our website and click on our specials button. (*Note: There is a two person minimum for standard queen and double queen and four person minimum for the three bedroom suite. Rates are per night and subject to change.) Rates Start At $95/night +$9.50 Tax and $15/Sandboard Rental per Person. For more information on Sand Master Park, click call 541-997-6006. To book this package or for additional information call or go online and click on the lodging packages link. 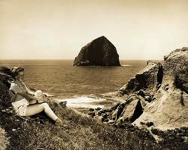 Come experience the Oregon coast like never before. Stay one night in an oceanfront room at Driftwood Shores and you receive a one-half hour helicopter tour for two when you book this package. Your helicopter tour takes you over Heceta Head Lighthouse, the Sea Lion Caves and other breathtaking coastal sites. The return ride heads inland over the coastal mountains, back down the Siuslaw River and Old Town Florence. Upon your return to Driftwood Shores, relax in your oceanfront room, stroll miles of Oregon’s sandy beach and enjoy dinner at the Surfside Restaurant and Classic Cocktail Lounge. What a day to remember! You must call 800-422-5091 to book this package. One night lodging for two in a standard queen room, plus a 1/2-hour helicopter ride for two. Prices start at $340.20. *Valid any day of the week. Package price does not include gratuities. Helicopter tour is through Apex Helicopter, Florence, Oregon. Helicopter tour is booked when lodging reservations are made. 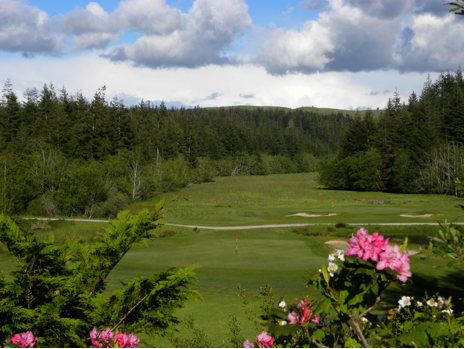 Take in the beauty of wild pink Rhododendrons while enjoying great golf at a great price at Bandon Crossings Golf Course. Just ask for the “Rhodie Special” and get 10% off standard green fees. Bandon Crossings is a challenging and fun course. “Majestic coastal trees, classically sculpted bunkers and uneven terrain provide the main challenge” says GOLF Magazine, who called it an “Affordable Alternative” to Bandon Trails, and one of the “Top 10 New Courses of 2007”. It is fast becoming one of the Oregon Coast favorites, and a visit to Bandon is well worth the drive and a few days to enjoy the golf and beaches. Stay in one of our Stay & Play Homes and get an additional 10% off rent by asking for the “Rhodie Special” (2 night minimum). We’ll make sure you get the best deal, and have a wonderful place to enjoy the beaches, golf, and everything Bandon has to offer.